Begin your walk through mediaeval Stockholm in the Old Town. Start by Stockholm Palace, built in 1697-1754 after a fire had totally destroyed the old palace. Visit Storkyrkan (Stockholm cathedral), Stockholm's oldest church dating from the 1200s. Take a little extra time to view the wood sculpture of Saint George and the Dragon. Head towards Stortorget, where the Stockholm massacre took place in 1520. In the Exchange Building (Börshuset), dating from 1778, stock exchange trading was carried on up until 1990; it now houses the Nobel Museum. Follow Köpmangatan down towards Österlånggatan. By Köpmantorget you will find a replica of Saint George and the Dragon in bronze. At Österlångatan 41 you can visit the Ice Gallery, where it is always -5 to -8°C. Here you will find ice works of art, and you can quench your thirst with a drink served in an ice glass. Why not take a tour of Riddarholmen and see Riddarholmskyrkan (Riddarholm Church), which, like Storkyrkan, dates from the 1200s. During the 1800s, Mosebacke Etablissement was a popular entertainment haunt for Stockholmers, and still is today. Alongside the square is the classical Södra Teatern. In the evening it is pleasant to have dinner at the Mosebacke Terrace and enjoy the view. Go past the Katarina Church. With the exception of the outer walls, the church was totally destroyed by a fire in 1990; the current building was completed in 1995. At the end of Mäster Mikaels gata is Glasbruksklippan with gardens that were laid out at the beginning of the 1950s. Sweden’s most visited museum enshrines the warship, Vasa, sunk inside Stockholm harbour while on her maiden voyage in 1628. The ship was built to the order of the great Vasa king, Gustavus Adolphus, and was the most powerful war galleon of her age. She was raised whole from the harbour bed in 1961, over 330 years after she had last seen the light of day. Carefully preserved, the ship now rests intact in the museum’s main hall. Displays recreate life on board the ship and a film shows how the salvage operation was carried out. The museum’s beautiful waterfront site on the island of Djurgården is an added attraction. There are guided tours in English, Monday to Friday 1230 and 1430, Saturday and Sunday 1030 and 1630. Voted by the Swedes as the country’s finest building, Stockholm’s City Hall was begun in 1911, to an Art Nouveau design by Ragnar Östberg. 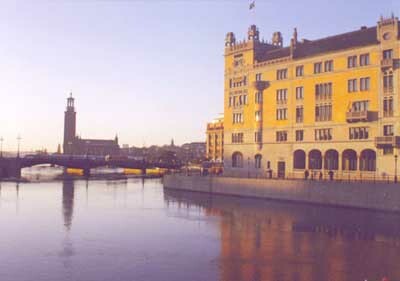 Its interior has grand civic apartments, including the Golden Hall, with its glass and gold mosaics, while its tower gives a sweeping panorama of Stockholm. The building’s Blue Hall – which is actually red – is the venue for the annual Nobel Prize banquet. Visitors must join one of the scheduled tours to see the interior, although access to the tower is unrestricted during opening hours. Situated in the heart of Stockholm, on the central island of Riddarholmen, the Royal Palace is the official residence of the monarchs of Sweden and the chief venue for official state events. With 608 rooms, it is among the largest surviving palaces in Europe. The present glorious Baroque edifice is the work of Nicodemus Tessin the Younger, from a 1692 design, however, parts of the older medieval Castle of Three Crowns still survive. Attractions include the Banqueting Apartments, the Apartments of the Orders of Chivalry, the Hall of State, the Royal Treasury, Gustav III’s Museum of Antiquities and the Royal Chapel. In addition, the changing of the guard at the palace is as much of a spectacle in Stockholm as it is in London. Haga Park is a pleasant for walks, bicycle tours or strolling between museums. Gustav III's Paviljong is a superb example of late neoclassical style. The furnishings and décor reflect Gustav III's interest in all things Roman, developed during his Italian tour in 1782. In Fjärils & Fågelhuset (Butterfly House), there's an artificial tropical environment with free-flying birds and butterflies. There's also a shop and cafe. Haga Parkmuseum has displays about the park, its pavilions and the royal palace, Haga slot. Sweden’s national historical museum, which traces the nation’s history from prehistoric times to the present day, is now graced by a spectacular Gold Room, housing the gold of the Viking chiefs. These hoards, recovered from tombs or hiding places, show Scandinavian Viking culture at its most prosperous and magnificent. There is also one of the finest European collections of medieval painted wooden religious sculpture on exhibition. Stockholm’s most famous cultural figure has his temple here. The Blå Tornet (Blue Tower) was August Strindberg’s last home, from 1908 until his death in 1912. His apartment and library have been preserved in their original state. An exhibition showcases his last works, written on the premises. The museum, which also hosts temporary exhibitions and plays, is furnished in a strikingly sparse Nordic Art Nouveau style. Skansen, the world's first open-air museum, was founded in 1891 by Artur Hazelius to let visitors see how Swedes lived in previous times. Today, around 150 traditional houses (inhabited by staff in period costume) and other exhibits from all over Sweden occupy this attractive hill top. It's a spectacular 'Sweden in miniature' and you could spend all day here. There are 46 buildings from rural areas around the country, including a Sami camp (with reindeer), farmsteads representing several regions, a manor house and a school. The town hall is topped with a golden spire and the symbol of Swedish power, the three royal crowns. Inside is the beautiful mosaic-lined Gyllene Salen (Golden Hall), Prins Eugen's fresco re-creation of the lake view from the gallery, and the hall where the annual Nobel Prize banquet is held. Entry with tours only. The Globe Arena had its opening in 1989. It took less than 2,5 years to construct this spectacular building. A sport and culture arena with seating for 16,000 spectators. Its contrasting profile makes Globen stand out from the rest of the Stockholm skyline. It had already become a symbol of the city during its construction. Drottningholm Palace, begun in 1662, was built to a design by Nicodemus Tessin the Elder. The surrounding park exemplifies both French Baroque and English romantic landscaping ideals. The palace itself, the theatre and the Chinese Pavilion have been placed on the UNESCO world heritage list. Gustav III's Pavilion, in Haga, is one of the finest exemplars of late Gustavian taste. The pavilion was furnished for Gustav III in the style of antique Rome during the 1780s and 90s. Gripsholm Palace houses a late 18th-century Gustavian theatre and is home to the National Portrait Collection. The palace is situated in Mariefred and was begun over 450 years ago. With its strong round towers the palace has a finely preserved 16th century interior and is typical of the fortresses put up by the Vasa kings. Count Gustav Horn built Häringe Castle in 1641, but Häringe's ancestry dates all the way back to Sote the Viking who lived here in the 1100th century. Since then there have been many different owners. Thorsten Kreuger who lived at the castle between in the 1930's built a two lane bowling alley and an outdoor swimmingpool with a slide from the second floor bathroom. Unfortunately the slide is no longer here but the bowling alley and the pool is till used by our guests. Axel and Marguerite Wenner-Gren bought the castle from Kreuger and lived here until Axel's death in 1961. One of Europe's best preserved baroque palaces and a testimony to Sweden's period as a great power. Splendid interiors, weapons and exotic objects, an unfinished banquet hall. Café, exhibitions, shop, children's workshop. In the greater Stockholm area, visitors will find much more than just the large city parks such as Kungsträdgården and Rålambshovsparken.